Germany has announced it plans to shut down all its nuclear reactors over the next 11 years, following public concern over Japan’s Fukushima nuclear crisis. The country plans to replace all of its nuclear power with renewable energy. Germany currently runs on 23% nuclear power, so it will be a massive task for the country to replace that much energy in just over a decade. It has the world’s fourth largest economy. Germany is planning to not reopen 8 nuclear reactors temporarily closed in March, during the Fukushima disaster, and phase-out the other 9 before 2022. Chancellor Angela Merkel has said the decision to close nuclear reactors should not lead to importing nuclear power. Merkel wants to prove that it’s possible for a major industrialized economy to achieve economic growth, create jobs and economic prosperity, at the same time as moving the country to renewable energy sources. The government has said that the renewable energy industry already employs around 370,000 people. This is an incredible turnaround in policy. 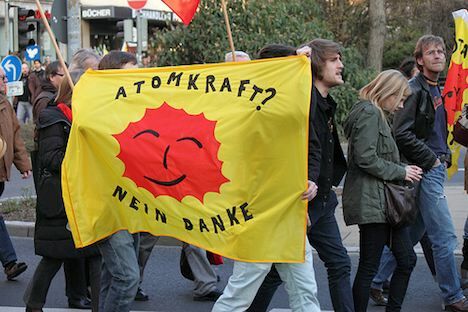 Just last year Merkel’s center-right government planned to extend the life of Germany’s existing nuclear reactors. Do you think Germany will be able to achieve its new goal in the set time?